It’s easy to take for granted how dependent we are on the energy stored in the batteries of all our various devices, that is, until we run out of battery power! If you stop and think about it, from the vehicle that we drove to work, to our cell phones, tablets, music players, and laptops we really are at the mercy of our batteries every day. So what do you do when you forget to charge something, or use up the charge sooner than you expected? Or what if you left your cars lights on this morning, and now are faced with a no-start condition because your battery is stone dead? Well, if you are the owner of a BOOST BX-800 all-in-one portable micro boost jump charger, you simply connect it to whatever needs the juice, and carry on! The BOOST BX-800 portable charger comes in a very nice carrying case that allows you to carry with you a wide variety of different connection and cable type to power up darn near anything you might have that needs some electrons! The BOOST charger comes with a USB connector that incorporates four pigtail ends, each with a different type of connector. You have connectors for almost any Apple device and two different mini USB connectors as well. Then there is another coaxial style cable and a wide variety of coaxial type adapter plugs for devices like laptops, GPS units, or portable music players. Also included are a set of rugged car battery booster-cable style clamps to be used to start your car, motorcycle, garden tractor, snowmobile ATV or darn near anything else that needs starting! How is this all possible? Thanks to new high tech lithium polymer battery technology, you can carry enough energy to start even a big V8 engine in your pocket. The BOOST jump charger has a capacity of eighteen thousand milliamp hours or 500 peak amperes of starting current. It also has the ability to provide 12, 16 or 19 volts of output, which allows charging of almost any laptop or tablet, plus it can provide enough current via the USB port to charge any tablet or smartphone. To charge the BX-800, simply plug in the supplied AC adapter or cigarette lighter plug to the input port. An LED display provides an indication of the state of charge. To charge your smartphone or tablet, all you have to do is flip the power switch to on, and connect your device to the USB port using the supplied adapter. You follow the same procedure for your laptop, with the additional step of selecting the appropriate voltage using the convenient pushbutton switch. The selected voltage is conveniently displayed on an LED display. In case of emergencies, the BOOST charger also incorporates a powerful built in flashlight that can double as emergency strobe beacon with two different selectable rates of flash. The folks at Boost claim the charger will retain a charge for up to a year, and it only takes about 8 hours to completely recharge from a full discharge. Additionally, it will work in extreme temperatures, where other batteries fail. So don’t get caught with a dead device or car! Carry a BOOST charger and be ready to recharge whatever you need to. No more missed calls or messages, and no more waiting on the auto club to rescue you. 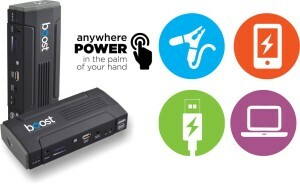 With this compact and lightweight charger, you can rest assured that you’ll have the power you need, when you need it! Check with a BOOST Authorized Dealer to inquire about what BOOST portable solutions fit your needs. The BX-800 shown here comes with a one year warranty, and has a suggested retail price of just under 200 bucks. The actual BOOST BX-800 carries a cable for asking for portable electronics which include iOS devices, some sort of cable for asking for laptops, and the chance to jump-start a vehicle. Its large power supply can fully boost an iPad. The Bad Merely one USB port limits the number of devices that might be charged at the moment. The Bottom Line Featuring a large lithium ion battery and variety of charging cable adapters, the BOOST BX-800 makes a fantastic charging solution for a range of devices, including laptops, and a must-have for cars with finicky power packs. Portable jump starters had been a basic car battery in a very plastic casing, weighing nearly 20 pounds. Right now, improvements in lithium ion batteries enable a whole new breed of soar starter, one that will fit in the glove compartment and weighs about 10 oz. Such is the BOOST BX-800, you’re able to send most powerful soar starter, which is additionally designed to demand your smartphone and myriad other electronic devices. At 6. 5 in . long, 3 in . wide and effectively under a lb in weight, I could truthfully easily carry the BOOST BX-800 around in a single hand. It’s a little big to easily fit in a pocket although would store in a very car’s glovebox or perhaps trunk easily enough. The BOOST BX-800 will come in a zippered nylon case, holding its a variety of adapter cables, which adds considerable size towards the whole package. You might like to leave all that in your house and just load up what’s necessary along from the car. The brick that is the BOOST BX-800 fits an electric switch, USB vent, charging port, universal output, jump-starter end result and on/off switch down one long side. There is additionally an LED exhibiting its charge degree, a handy function, and a press button that turns within the integrated flashlight. Combined with basic unit, BOOST BX-800 carries a battery clamp adapter, some sort of white multijack adapter having older and more modern iOS plugs and plugs for Mini- and Micro-USB, and a universal cable with ten different plugs for different type digital camera charging ports. Moreover, there are HVAC and 12-volt adapter cords to charge the BOOST BX-800. To charge up my iPhone 5S, I had to plug from the white multi-adapter cable (or I could truthfully have used my own, personal iPhone cable), then start the power switch. To further test the capabilities in the BOOST BX-800, I plugged with another device towards the Mini-USB plug simultaneously my iPhone was connected, and both charged simultaneously. As the BOOST BX-800’s battery is rated at 13, 600mAh potential, it could charge up my 1, 900mAh iphone 3gs 5S battery eight times over. Furthermore, that amount of power is plenty to fully charge every other smartphone in the marketplace, not to point out most tablets. The actual USB port components power at 3. 1 amps, the maximum for USB 3. 0 charging. When using the universal output cable can be a little trickier. This adapter will continue to work with almost just about any electronic device that has a round port for charging. It includes ten different-size plugs to fit all the different different charging ports on devices. Additionally, you have to find out the charging voltage of your device. The BOOST BX-800 lets you change the end result voltage of it’s universal port between 12, 16 and 19 volts. I found the right plug one of many eight available to get a portable audio recorder, and noted that this recorder’s DC feedback was labeled for 13 volts. Plugging from the cable, I was very happy to find that the D28 was smart enough to select its 12-volt setting and would not let me switch to your higher voltage. These round plugs will even fit many Windows laptops in the marketplace, making the D28 a great all-around portable burn battery. One in the BOOST BX-800’s key functions is its chance to jump-start a vehicle. Unlike a common portable battery backup exclusively for charging devices, the BOOST BX-800 includes battery clamps that plug right into a special port with its side. Additionally, it may output a top 500 amps, enough to jump start a typical passenger auto engine up to your V-8. To test the BOOST BX-800’s jump-starting functions, I borrowed some sort of Ford Country Squire station wagon having a 5-liter V-8. The vehicle did not have a dead battery, i really took the good battery cable off the battery. I attached the BOOST BX-800’s black battery clamp towards the car’s negative incurable, and the red clamp towards the positive battery cable. Turning the Country Squire’s ignition important, the engine dismissed from your job right up, as if it had a totally charged battery. Eventually, as a convenience feature, the BOOST BX-800 carries a white LED flashlight built-into its end. To utilize it, I was required to turn on the leading power switch, then push and hold a 2nd button on the side of the device until the light came about. Touching the subsequent button again started off the light pulsating, with two different selectable frequencies. The flashing light would are available in handy in case you are signaling other vehicles for help on the side of the trail. The list price for that BOOST BX-800 can be a hefty $149, although its wide variety of capabilities for charging portable consumer electronics and laptops, and jump-starting a vehicle, could save you considerable time and headaches, in addition to roadside assistance charges. I prefer that the BOOST BX-800 carries a dedicated power switch, so you know if it’s on. The LED charge indicator is supplied in handy. The universal cable adapter and HARDWARE port make the BOOST BX-800 work for almost any electronic device it’s likely you’ll have, including newer iOS devices because of their Lightning adapter connects. However, only having one particular USB port chemistry of the D28 may possibly prove a limit, especially if you want to charge two iOS devices simultaneously. Likewise, there is no capability to demand Macbooks. The flashlight can be a nice accessory function, especially as you may be fumbling around searching for your battery terminals over a dark and raining night. One issue that larger portable jump starters from time to time include, that BOOST BX-800 D28 lacks, is usually an air compressor. Nonetheless, its small size makes it simple to stow in a car, so you are more likely to have it handy when your battery quits.